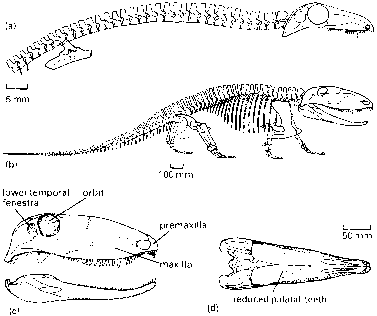 The relationships of the basal vertebrate groups to each other have been controversial. 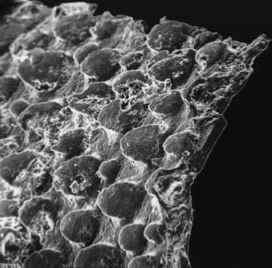 For a long time, zoologists grouped the living lampreys and hagfishes together as Cyclostomata. 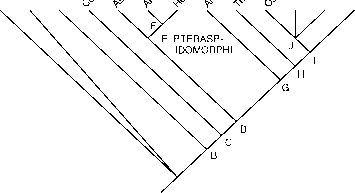 The first cladistic studies, however, broke up Cyclostomata, and distributed the various clades of jawless fishes between the two living groups, either as close relatives of the hagfishes or of the lampreys (reviewed, Janvier, 1984; Maisey, 1986; Forey and Janvier, 1993). A recent comprehensive cladistic analysis (Donoghue etal., 2000; illustration) confirms that myxinoids (hagfishes) are the basal vertebrates. Next in the cladogram come petromyzontids (lampreys), and then conodonts. The pteraspidomorphs (astraspids, arandaspids and heterostracans) come next, then the anaspids, thelodonts, a clade of forms with a heavy head shield (osteostracans, galeaspids and pituri-aspids), and then the gnathostomes. The cladistic analysis highlights many morphological characters that are shared between lampreys and gnathostomes and that are absent in hagfishes. There is, however, a major discrepancy between this result and current molecular phylogenies. Analyses based on rRNA (Mallatt and Sullivan, 1998), nuclear DNA (Kuraku et al., 1999), and on a variety of genes (Furlong and Holland, 2002; Takezaki et al., 2003) strongly support Cyclostomata as quite distinct from Gnathostomata. Future work will focus on resolving this discrepancy in results: is Cyclostomata valid, and hence the morphological characters must be wrongly coded, or are they right and the molecular results somehow misleading, perhaps because of convergence in the genes? Cladograms showing the postulated relationships of the jawless fishes and the Gnathostomata (jawed fishes) based on morphological characters. See Box 1.1 for context of Vertebrata; see Figure 3.12 for phylogeny of Gnathostomata. Selected synapomorphies from Donoghue et al. (2000): A VERTEBRATA, neural crest, brain, optic tectum in the brain, unpaired fin ray supports closely set, paired olfactory capsules, at least one set of semicircular canals; B, extrinsic eye musculature, two or more semicircular canals, sensory line-system with neuromasts, electroreceptive cells, gills symmetrical, open blood system, arcualia, braincase with lateral walls, sexual dimorphism; C, calcified dermal skeleton; D, cerebellum, vertical semicircular canals forming loops well separate from the utricle, trunk dermal skeleton; E PTERASPIDOMORPHI, oak-leaf-shaped tubercles; F, cancellar layer in exoskeleton, large unpaired dorsal and ventral dermal plates on head; G, paired fins or fin folds [reversed in Galeaspida]; H, sensory line enclosed in canals [shared with Heterostraci], opercular flaps associated with gill openings [reversed in Gnathostomata and Galeaspida], dorsal fin [shared with Petromyzontida]; I, large lateral head vein, neurocranium entirely closed dorsally and covering the brain, occiput enclosing cranial nerves IX and X, perichondral bone, globular calcified cartilage; J, gill openings and mouth ventral, massive endoskeletal head shield covering the gills dorsally.